Once an underachieving scholar from the famous Melfian Magic Academy, now an unhinged hexer clearly obsessed with Dark. It's unclear whether he was genuinely drawn to Drangleic in his search of the darkest darkness or was just another Undead who fell for it. 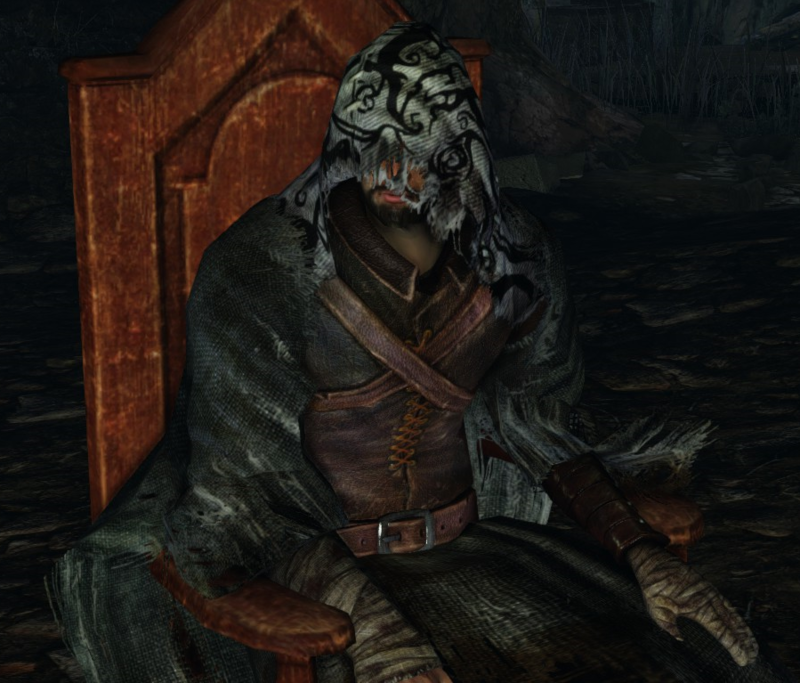 Right before the Undead Refuge bonfire, sitting in a chair and staring straight into a stone wall. Sells various hexes. Refuses to deal with anyone who doesn't have at least 8 base Faith and 8 base Intelligence1. Ring of Life Protection 1 6,000 Saves souls on death, but breaks. Dark Pine Resin ∞ 1,500 Apply Dark to right-hand weapon. His armor will be available for purchase from Merchant Hag Melentia. He's impressed by power. Talk to him with at least 20 Faith and 20 Intelligence and he will gift you his hexing apparel and Sunset Staff. Stat-boosting items won't count towards his requirements. You must naturally have every point. Players may meet his requirements, speak to him once, then soul vessel to return faith and intelligence to base levels, and still have access to his wares upon returning to talk to him. Killing him will not affect your standing with the Pilgrims of Dark. I don't know who you are…But leave me be. I am interested in one thing. Dark. You haven't the gift. I will trade with you. What do you need? This land…lies closest to the Dark… Th-that is…that is why I came here. Save a few misfits like myself…hah hah. I-I learned nothing…nothing at all… I-it was there that I happened upon the Dark. Soon, I was drawn to this land, where Dark runs deeper than anywhere else. They were once…a form of sorcery. But the practice was lost…then later rediscovered. Those devoted to hexes are a lonely lot… But nevertheless…they give their lives to their art. What drew me to the Dark…I…I…I do not know. Those who discover Dark…realise this… And…they never come back. One day…I will share your fate. I cannot…let you have this. 1. Only base levels count, stat boosting items like Ring of Prayer and Goldenfruit Balm have no effect.